Food Safety for Managers is the only online food safety class that you can use on all your devices: desktops, laptops, iPhones, iPads, smartphones or just about any mobile device, Mac, Windows.. it’s all good here! Utilizing HTML5 and other non flash alternatives you can learn on the go with the new Food Safety for Managers online food safety course! By the time you figure out if the other course is compatible with your system you could be done with Chapter 1! Food Safety for Managers is a perfect way to study for any of the nationally accepted exams like ServSafe, NRSFP, or Prometrics. The class is rated as 8 hours of study time but if you took advantage of all the video and study materials it could take well over 16 hours to complete. The level of depth is controlled by you. Please be aware these online food safety courses are the training only and that you must pass an exam approved by your jurisdiction to become certified. The cost of the exam is not included with the online course fee and even though there are online exams, they must be taken in the presence of a registered proctor to prevent cheating. We can help you find the closest testing center (there are thousands nationwide). 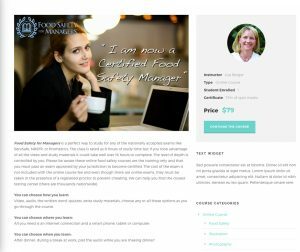 The Food Safety for Managers online food safety course is sold as an unlimited study option for a single user for $79. Unlike other online food safety classes we allow you to demo a portion of the class free - we have nothing to hide. The course offers unlimited study time for $79! Save $50 when you register for an exam at the same time! Learn More at the FSM site! I just wanted you to know that thanks to your advice the online course was perfect for me when I have a few minutes here or there, like on the train during my afternoon commute. The audio made it easier as I could listen even while I was walking. It was nice to be able to go back and forth between lessons. I have even used it in real life looking up information in the class that I used in my restaurant.